Elliptical galaxies much younger than previously thought? 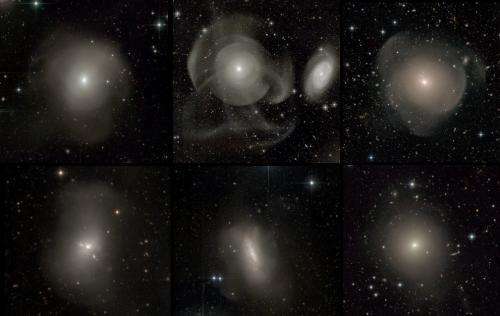 (PhysOrg.com) -- The standard model for elliptical galaxies formation is challenged by a new result uncovered by an international team of astronomers from the Atlas3D collaboration. Team members from CNRS, CEA, CFHT, and the Observatoire de Lyon published in the scientific journal Monthly Notices of the Royal Astronomical Society the first results from their study on two elliptical galaxies exhibiting features characteristic of a fairly recent merging, suggesting they are five times younger than commonly thought. The common belief on the mass assembly history of massive elliptical galaxies based on their stellar population leads to an age between 7 and 10 billion years old. A different story is shaping up based on ultra-deep images of two galaxies observed with the MegaCam camera mounted on the Canada-France-Hawaii Telescope (CFHT, CNRC/CNRS/University of Hawaii). Astronomers from CNRS, CEA, CFHT, and the Observatoire de Lyon, all members of the Atlas3D international collaboration, established that the formation of the two studied elliptical galaxies (NGC 680 & NGC 5557) originated from a merger of two giant spiral galaxies that took place only 1 to 3 billions years ago. Such age estimate is based on the presence of ultra faint filaments in the distant outskirts of the galaxies. These features called tidal streams in the astronomers parlance are typical residuals from a galaxy merger. They are known not to survive in this shape and brightness for more than a few billion years, hence the new age estimate of the resulting elliptical galaxies. These structures were detected for the first time thanks to a very-deep imaging technique boosting the capabilities of CFHT's wide-field optical imager MegaCam. The Atlas3D team conducts a systematic survey of more than one hundred nearby elliptical galaxies. If the current result based on the first two galaxies is confirmed on the larger sample, i.e. faint extended features are frequently detected, the standard model for elliptical galaxies formation should be revisited. Interesting article. And Kevinrts, before you make your standard ignorance-based comments about how this all goes to prove that cosmology has got it all wrong and that your deity created the current universe in just a few days, this is how science works - unlike religious dogmas, scientific theories get revised in the light of new evidence. Most likely by looking at their pet models which the mainstream "ignores" and even "conspires against." 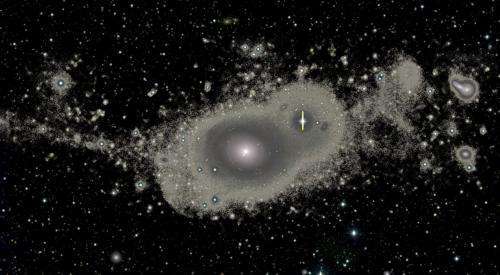 "...the formation of the two studied elliptical galaxies (NGC 680 & NGC 5557) originated from a merger of two giant spiral galaxies that took place only 1 to 3 billions years ago." One of the questions asked is whether these two galaxies are representative of the other 260 nearby ETGs in the ATLAS sample. Too early too tell, I'd say. In addition, the characterization of Tidal Dwarf Galaxies surrounding NGC 5557 and faint tidal debris around NGC 680 really shows off the merits of these new, deep, CFHT images. Looking forward to the completion of the survey and what surprises it may uncover in the ATLAS sample. The first thing I think of in regards to this is what different environment is the elliptical within now that the original spirals did not have? I believe this will lead to a better understanding of the physics behind spiral arms in galaxies. People at this address think that the Big Bang and all that it implies (superluminal recession speeds etc) is wonderful. This would make sense if galaxies are credited as sort of a gravitational capacitor or sinkhole. The smaller galaxy that gets too close discharges most of it to the bigger galaxy and some continues flying by. This after 'lost' debris then re-coalesces into the typical elliptical and/or globular clusters. Photos appear to show expanding superwave shells of matter ejected from the galactic cores. Note how in each case the shells are centered on the galactic centers. This explanation is simpler than trying to assert that each is a result of some complex merger that resulted in such concentric symmetry centered on the core. Should one not at least consider the simpler explanation??? The fact, galaxy appears elliptical means, the tidal forces wiped out all irregularities in the motion of its stars. It's similar to situation, when young planet would revolve the parent star along circular path. This process indeed requires a lotta time. So we should find some mechanism, how the galaxy would get its regular shape faster, or how the stellar streams could survive longer. I'm somehow inclined to the later option. For example, we could imagine, the stellar stream coincides with invisible dark matter stream, which stabilizes and freezes the stars in it like fiber of invisible slime. I see nothing compelling in the theory you keep preaching tuxford, nice try though.